Non-stop action is what “Jailbreak” is all about. Martial arts enthusiasts should be well aware of the fighting techniques used in the movie, which consist largely of Khmer martial art, Bokator. Two of the movie’s main cast, Dara Our and Tharoth Sam, are no strangers to the fighting style, which can be easily identified by the sharp movements that include elbow and knee strikes as well as ground fighting. While outside of Cambodia, Bokator has a relatively smaller recognition compared to other forms of martial arts, there still exist gyms in countries such as France, the UK, Iran, Ireland and Australia that practices it. The instructors are either representatives sent from the countries to learn and bring back the knowledge of the ancient martial art to their lands, or Cambodians who fled the Khmer Rouge and are now teaching Bokator abroad. Ancient it may be, it is being revived by the current generation and is gaining more popularity, partly thanks to active supporters such as Dara and Tharoth themselves. Both are well-versed in Bokator, trained by grandmaster San Kim Sean. Tharoth admits that she would talk about Bokator every chance she gets in interviews, especially to encourage more girls to learn it, not just as self-defense but also for the preservation of the Cambodian culture. Learning it was no easy feat, even for the MMA fighter. She gave up for a year before returning to practice it until now. Dara comes from a martial arts background as even his great grandfather is a Bokator master. His interest for martial arts grew when he was 15 but at the time, he didn’t have the chance to practice it. He learnt Karate and only occasionally trained with his father and grandfather. He finally had the chance to sharpen his Bokator skills after training under the grandmaster. 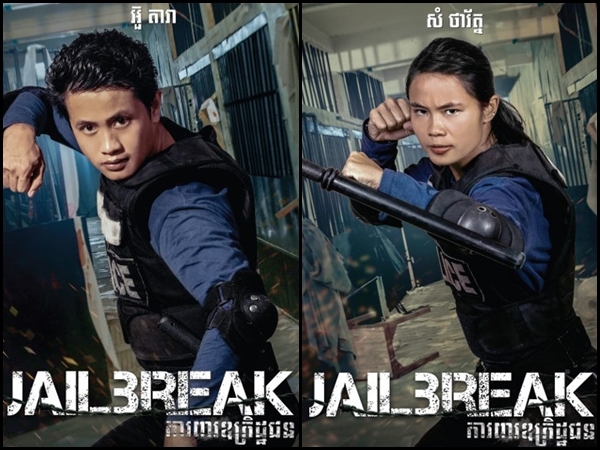 The duo gets to show off their Bokator skills in the upcoming “Jailbreak”, the movie directed by Cambodian-based Italian director Jimmy Henderson, which also stars French-Cambodian action star Jean-Paul Ly, actors Savin Phillip, Sisowath Siriwudd, Sok Visal and Dara Phang, and actress Celine Tran. Dara and Tharoth recently attended the cast and crew screening for “Jailbreak” and JaiKon was there to catch up with the two to talk more about the movie. The duo shared their experiences working with Jean-Paul Ly, working with Hollywood star Angelina Jolie (for Tharoth) and their passion for Bokator. Tharoth and Dara being interviewed before “Jailbreak” gala premiere. JaiKon: You have just watched your movie “Jailbreak”, how does it feel like watching it on the big screen for the first time? Tharoth: I feel happy and super excited to see the movie onscreen. I feel overwhelmed. I really like the movie and appreciate all the effort the team, cast and crew, put together. We all worked really hard, from morning till midnight. For all the hard work we’ve been doing, now we can finally see the result. Dara: When we were watching the movie, I feel so proud of our team because we worked hard together. [We started training] three months before shooting started. For the other departments, like script writing, they started one or two years ago. For our team, stunt team and cast, we worked hard designing the stunt choreography before shooting. Then on set, we worked hard again, sometimes we got injured but we still tried to finish on time. When we watched the movie, we felt amazed by the result and really miss the good memories together when we were shooting. Tell us a bit about the characters you play in the movie. Tharoth: My character in the movie is like me in real life. The director and producer said, “Well yeah, we’ll use you as you”. They wanted someone that feels confident and brave and doesn’t need help from any guy, can do work and fight like guys. That’s how I am. In the movie, I’m one of the police, in the same team as Jean-Paul Ly and Dara. Dara: My character in this movie is in the special force, like she said. In the movie, I don’t like people who want to control me. I like to decide for myself. That’s why in the beginning of the movie, I didn’t communicate well with Inspector Ly (Jean-Paul). But after we got to know each other better, we started working together to survive. Working with Jean-Paul Ly, how was that like? Dara: He’s nice. He’s flexible. When he works on Hollywood productions, they have good accommodation. In Cambodia, it’s not the same as Hollywood. But he enjoyed working with us, he can work like the local people. Tharoth: When he came here, I was like, “how could we communicate with him?” But actually he’s really like a family. When we started training together, we became closer like family, like brothers and sisters. He’s really polite, humble and a nice guy. He always thinks about the team. Every time we were shooting, he always cared about safety. He’s very professional. “Jailbreak” character posters for Dara and Tharoth. Tharoth, you also acted in the Netflix movie “First They Killed My Father”, what is your character there and how was it like working with Angelina Jolie? Tharoth: The role is so mean. I have to be part of the Khmer Rouge. I had to be so mean and teach the kids how to be strong and fight the enemies. It was so hard because I’m not mean in real life but in character, I had to be yelling all the time. I was so excited to be working with Angelina Jolie. After I performed, she looked at the monitor, at how I fought, how I acted. She gave me a thumbs-up and said I was a wonderful woman. I never forgot her praise, I even wrote down what she said to me. The movie will premiere on 18 February. I’ll be going to the premiere if I’m not busy. You had to use your Bokator skills in it too, just like in “Jailbreak”, looks like the influence of Bokator is definitely spreading? Tharoth: We’re the young generation who represents the Khmer martial arts. Dara and I are both in the Cambodian Bokator Federation. Dara: For Bokator, the people in Cambodia, they know what it is. But for the people outside of Cambodia, they don’t know that Cambodians have our own martial arts. People know about Angkor Wat but they don’t know what art is represented at Angkor Wat. On the walls at Angkor Wat, there are sculptures, showing techniques of martial arts on the walls. So that is Bokator. It’s really traditional, our Khmer people created the art for this country. Now, there’s no more war so we train for our health and to preserve our culture. Will we be seeing more of Bokator in movies? Dara: We transformed the martial art to become art for movie. For martial arts in movie, we see Muay Thai, Kung Fu and many other martial arts but for now what is Bokator, where is it from, it’s new for the people around the world. We want them to know more about Bokator. Watch the cast of “Jailbreak” break out their Bokator skills on the big screen on 31 January 2017!